16: Love, The Legal Eagle. These are some of the first batch out of Rusty’s birthday camera. Typically, for no earthly reason at all, I haven’t used it up to now. Always meant to of course. There were some better ones, but I sent them to her–so she would think the camera was doing fine. There’ll be more soon. About this leave–we have just gotten a captain–we had a second looie as acting company commander up to now, and what with one thing and another I just feel I can’t leave now. Things are being shifted around, and I have the feeling that if I turn my back I might end up some spot that I don’t want–see, we’re supposed to have one captain and 5 looies–but we have seven of them. I don’t think it’s likely that I’ll be moved, but there’s nothing I would dislike more–I want very much to stay with the boys I have trained–I think that they’re going to whip up into a first-rate platoon. The new CO is not the right type–Irving Schechter–little thin, sad-eyed Jewish lad, only been in a little over a year–inclined to be timid and self-effacing. Not the natural leader type necessary to run this bunch of Marines. He’d make a good executive officer, second in command, but so far the company as a whole doesn’t like him. Tho he’s only been here for a week. But the Major is now talking about staying here till June, and the way things look, I wouldn’t be at all surprised if we were going to–it’s definite now that we’ll be here through March, and I think that we will be here well into the summer. So there will be plenty of chance for leaves later, at more appropriate times. I’ll probably ask for one late in Feb. or early in March. This will all have been settled by then. The Major appointed me income tax expert for the battalion, and I’ve been spending some time on that, and finally figured it down to where I only pay 7 bucks! And it’s legal, too! Isn’t that wonderful? For a while I thought it was going to be well over a hundred–but it is going to be astronomical next year. Incidentally Mother–I don’t know whether you’ll have to pay, but you’d better look into it. I only know the dope for servicemen–but over $500, you’ve got to think about it. Gifts to you don’t count on your income–I, for instance have paid on the little I sent you already. Gretch isn’t dependent, but I don’t know whether income from life insurance is exempt. It probably is, but you’d better find out. Gretch, I think that H&F is swell–honest to John. It is a wonderful job. And I’m proud as punch of my sister–I showed it all around the office and they were all quite impressed. As usual the spots were best, and I agree about the illustration for the second story. You didn’t “stay loose” as the Marine saying goes–seemed sorta forced. But the one for the first was good. Didn’t look like your work, though. Was it? The angel[?]. Really tho Gretch, you’ve got something to show there that does you proud. Rusty got a big kick out of the one you sent her. The First Separate Battalion (Reinforced) was growing to its full, authorized strength. More experienced NCOs arrived each week to leaven the mix of young privates and brand-new officers. Early in January, Company B received a new commanding officer, Captain Milton Cokin. And at the end of the month, “Big Harry” Reynolds stepped down as skipper of Company A, to make room for Captain Irving Schechter. 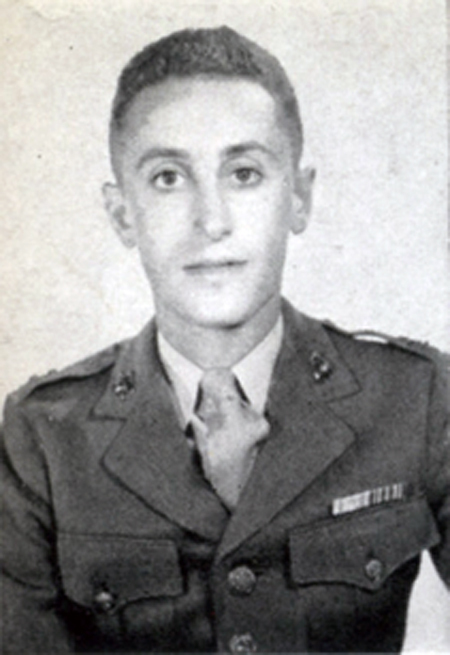 Schechter was twenty-five years old, the son of Austrian Jewish immigrants, a graduate of the University of Iowa, New York Law School, and Quantico. 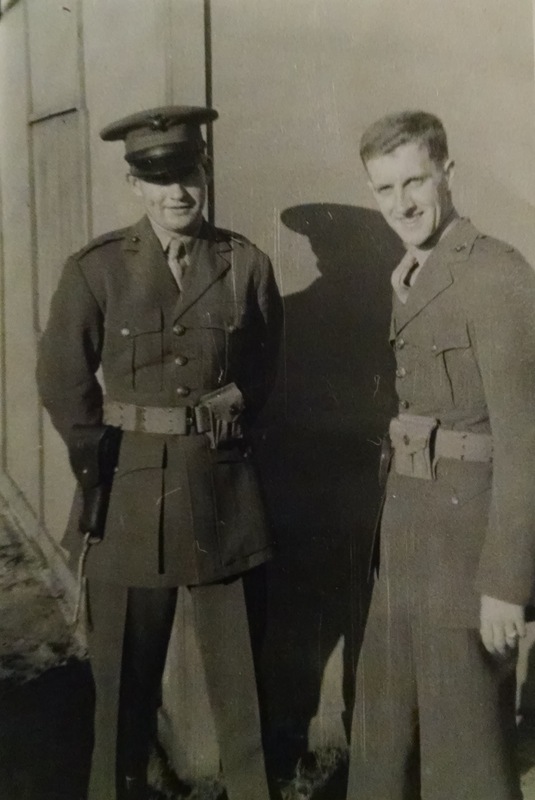 Putting his law career on hold seemed a small price to pay for the chance to defend the country from the Nazi scourge, and Schechter entered the Marine Corps in February, 1941. He was one of twenty young officers sent to Panama’s Canal Zone shortly after Pearl Harbor, but rather than fighting German soldiers Schechter found himself polishing up a company’s worth of new enlisted men. The experience led to his promotion to captain in August, 1942. Schechter finagled his own way back to New River to take command of a rifle company–and found himself giving “rugged infantry training” once again. Phil, on the other hand, had caught the attention of Major John Dolan, the battalion commander. On top of his regular training duties, Phil found himself advising teenaged Marines in filling out their first tax forms. His penchant for legal doings was not going unnoticed either, and his buddies dubbed him “The Legal Eagle”–a nickname that would stick with him for the rest of his life. Gretchen, meanwhile, was settling into her job as art editor for Home & Food – “The Good Food Stores Magazine” – and was striving to make it “a well-rounded book… in each issue a fictional story, movie reviews, mini-biographies of famous folks, housekeeping tips, restaurant reviews, and all sorts of illustrations–photos, purchased artwork, and quite a lot of stuff of my own.” During her time at H&F and at subsequent magazines, she would send issues off to impress her big brother. A pair of H&F covers created during Gretchen’s tenure at the magazine. No date, but probably Sunday, February 7, 1943, as Captain Schechter has been present for one week. Believed to be the same Sunday as previous letter to Howard Rapp, as Phil’s appointment as income tax officer is still recent news. Evidently this letter contained some photographs. Unfortunately, only one of Phil’s photos from this time is known to survive. Captain Irving Schechter joined on January 30, 1943. Prior to his assignment, 2Lt. Harry D. Reynolds Jr. was acting commander, with 2Lt. Chase Small as executive officer. Upon Schechter’s arrival, Reynolds became the company exec. A/1st Separate Battalion had six lieutenants, not seven: Edwin Keyes, Endecott Osgood, Harry Reynolds, Chase Small, Phil Wood, and Roy Wood. The use of “lad”–Marine parlance for subordinate–is quite derogatory in the context of speaking of one’s commanding officer. Despite this negative first impression, Schechter would soon be universally adored and respected by men and officers alike; although other officers later commanded the unit, Company A was always “Buck” Schechter’s company. Major John J. Dolan, battalion commander. Gretchen (age 18) had recently landed a job as art editor with “a small monthly magazine called ‘Home and Food,’ which was an advertising giveaway designed to promote the sale of a kitchen condiment called Kitchen Bouquet.” It was the start of her long career in graphic design.